Lisa is a parent at Alton Public School in the Headwaters Region, and we recently connected with her to talk about the laudable Headwaters Food and Farming Alliance (HFFA) Local Food Club (LFC), which delivers local food to participating schools in Dufferin County and Caledon, aiming to connect local growers and eaters while encouraging kids to cook and enjoy fresh, healthy foods. “It’s about good eating and making connections,” Lisa says. 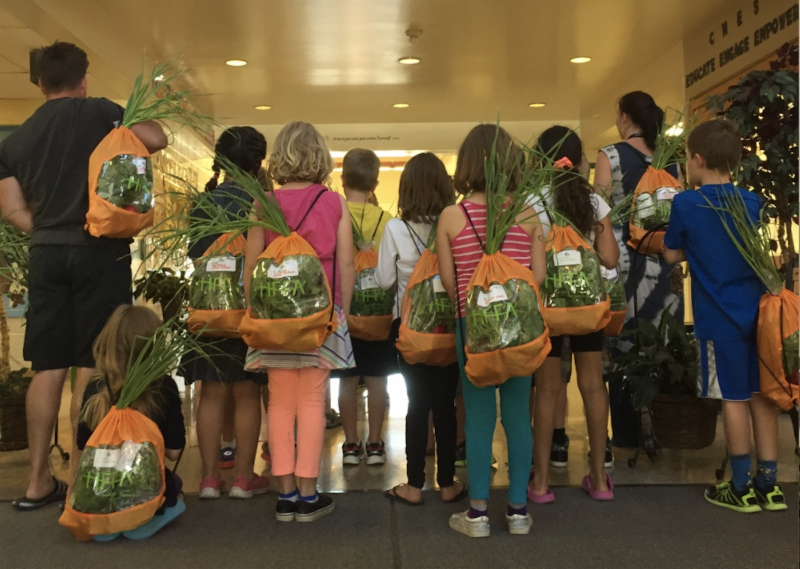 Members of the Club receive monthly “meals-in-a-bag” packed with a variety of local foods, information on the local farmers and suppliers, seasonal recipes, nutritional report cards, and even tips for cooking with kids! Fittingly, the “meal in a bag” is a meal in a backpack – a sensible pick-up for students and staff at school. Each monthly pack costs $20, with 10% of the school’s annual sales donated back into the school. Supporting schools, local farmers, and healthy eating among young people, it’s beneficial in every direction. Alton Public School joined the Local Food Club last fall, after Lisa first learned about the Club while attending a HFFA Education, Literacy and Access group meeting. Excited by the initiative, Lisa championed bringing the program to her child’s school, where she now helps pack and deliver the bags when she can. Supporting and participating in a healthy local food system is a big motivation for Lisa. The Headwaters Local Food Club is presently running in 11 schools in Alton, Shelburne, Orangeville, Bolton, Mono and Mulmur. Currently, they’re busy assembling about 145 LFC backpacks per month, but they hope to increase that membership soon. With the end of their grant approaching, but with plenty of excitement and engagement in the program, the HFFA team is now exploring sustainability and fundraising options to continue growing. If you’re in the Headwaters Region and interested in joining the Club, whether you’re a teacher, educator or a champion parent like Lisa, check out the HFFA website for more information.